One week ago, I started, for the first time ever, preparation for Total Consecration to Jesus through Mary, but I am not going it alone. A great up-and-coming Catholic evangelist, Gary Zimak, has led this consecration each year for the past four, using Fr. Michael Gaitley’s 33 Days to Morning Glory. So far, the past week has been enlightening both personally and as a model for offering Total Consecration to my parish in November. Our bible study this year will be Mary: A Biblical Walk with Our Blessed Mother. 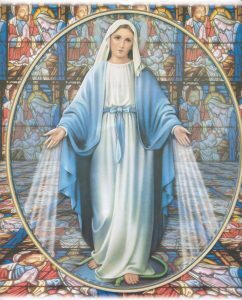 In conjunction with this study, I will also offer the 33 day preparation to Total Consecration to Jesus Through Mary, popularized by St. Louis de Montfort. During the course of that first week, with Fr. Gaitley’s focus on the insights of St. Louis de Montfort, I was asked to surrender all of the merit I would have received from any good works I may have done during my lifetime. That would mean that at my particular judgment, when I stand before Jesus Christ, I will stand before Him empty-handed. Mary will have claimed all those merits. What is it like to stand before some authority figure in my life with nothing to show for my efforts? Downright frightening! It so happened that right at this time, I was called into an interview and had to show some occupational merits. Anyone going through an interview process feels this anxiety, especially beforehand: Not knowing what will transpire. The “not knowing” what this meeting would be like left me with an overactive imagination, picturing all sorts of scenarios that others had put into my head. Some of these scenarios left me either angry enough to lash out, or frightened enough to simply hide in a corner. But int he final analysis, it was the “not knowing” that caused the most angst. It was this experience that I transferred to my spiritual life, specifically my walk through this preparation to Total Consecration. When I stand before the Just Judge, Jesus Christ, perhaps at His mahogany desk, my hands empty in my lap. He questions me as to what I have to show for my life. I pictured myself on the verge of tears, remembering the life I had lived, and doubting whether I had followed His Gospel closely enough, second guessing whether I come up short. I open my mouth to speak, but no sound comes out. ‹ The Last Stand for Freedom!